Ballinamallard moved three points clear of the promotion/relegation play-off place with this scoreless draw against Ballymena at Ferney Park. United twice went close before Mallards defender Mark Stafford headed against the woodwork. Stafford headed just wide on the restart while Ballymena's Darren Boyce dragged his effort off-target. Aaron Shanahan saved late on from Stafford's header with the ball scrambled off the line. 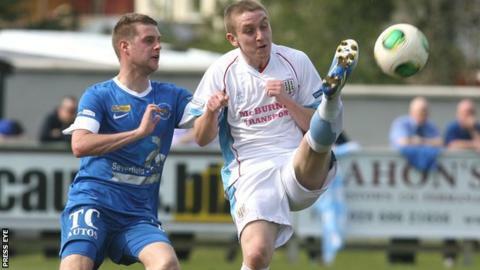 Ballymena striker David Cushley saw his early free-kick deflected wide before Mallards keeper Fergal Murphy kept an Allan Jenkins shot. It was a frustrating day for Stafford with the defender coming closest before the break when his header hit a post. Ballinamallard have a three-point advantage over Warrenpoint with two games left while Ballymena are preparing for the Irish Cup final against Glenavon.